(NaturalNews) Without enough vitamin C, cell growth and circulatory health can be compromised (1). Vitamin C is necessary to ensure that the system develops properly and is able to function well every step of the way; however, many people may be deficient in this nutrient, which can lead to an inability for the immune system to operate at peak effectiveness (2). Those with a vitamin C deficiency may experience a variety of symptoms ranging from fatigue and weight loss to bruising easier and having more muscle and joint aches (1). According to the National Institutes of Health (NIH), it's recommended that adult men consume 90 mg of vitamin C daily and that adult women obtain 75 mg daily (2). The amount varies depending on age, gender and other factors such as if a person is pregnant or breastfeeding. While an orange is likely the first food to come to mind as the go-to vitamin C source, there are other foods that top its levels of the nutrient. For example, one navel orange has about 83 mg of it, but a small papaya has 96 mg of vitamin C (3). 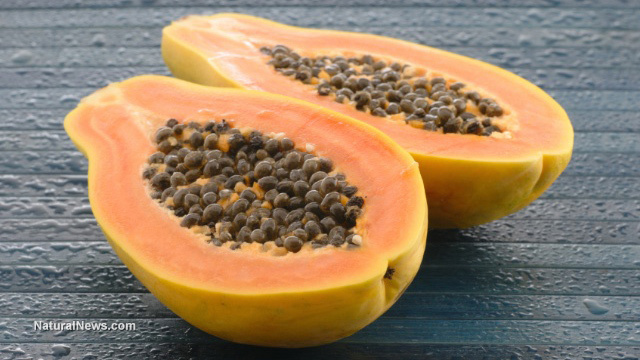 Additionally, papaya has other health benefits including the fact that it's high in fiber and folate. Broccoli is another food with a high vitamin C content; one serving has about 132 mg of the nutrient (3). According to The World's Healthiest Foods website, "Amongst all of the commonly consumed cruciferous vegetables, broccoli stands out as the most concentrated source of a premiere antioxidant nutrient--vitamin C (4)." Strawberries also contain high levels of vitamin C. One serving has nearly 87 mg of it, and consumption of them has also been linked to reductions in cognitive decline (3). Cauliflower, with nearly 128 mg of vitamin C in a head that's about 4 inches in diameter, is another source of the nutrient. The World's Healthiest Foods also touts this food as an "excellent" vitamin C source that does wonders for fighting damaging free radicals in the body and acting as an anti-inflammatory (5). Eating these foods on a regular basis can increase vitamin C levels and boost overall health. As always, choose fresh, organic options.